Butternut Squash Pasta Bake + A Vitamix Blender Giveaway! This Butternut Squash Pasta Bake is a great weeknight meal dinner! 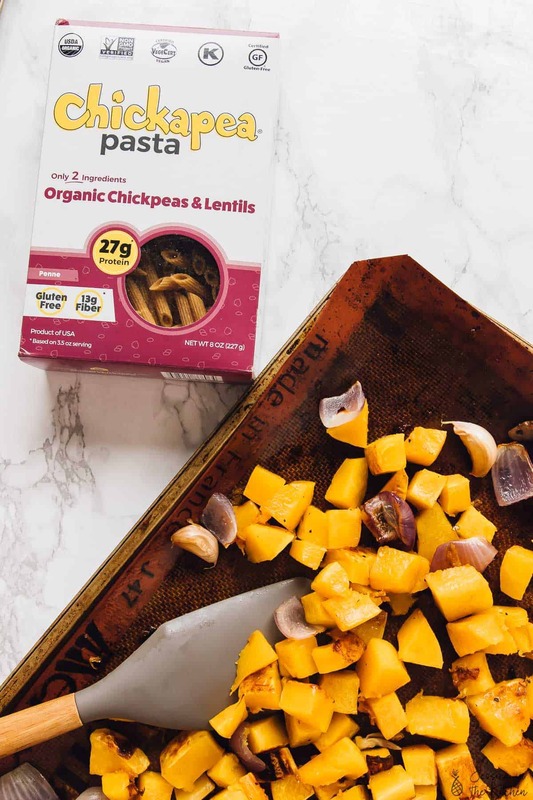 It’s loaded with protein, has a divine butternut squash pasta sauce and tastes absolutely delicious! If you follow me on Instagram, then you definitely saw the making of this insane Butternut Squash Pasta Bake. I got an overwhelming response from you guys about how badly you wanted to try this and I’m happy to say – it’s finally here. 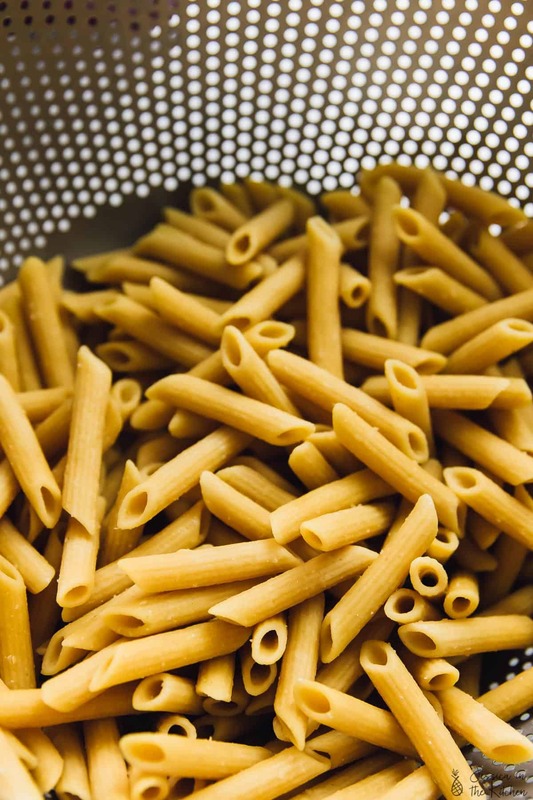 Today is National Pasta Day – woohoo, so it was the BEST day to share this with you! This pasta bake is easy, and has straight forward steps that are so worth it. By the way, this tastes even better as leftovers. This butternut squash pasta bake has some divine, base ingredients. A creamy pasta sauce made of the butternut squash itself, which is turned into a kind of Alfredo sauce. Honestly, this recipe wins from this alone. Of course I needed to amp up the bake by adding oven roasted/caramelised onions, tomatoes and mushrooms. I then added in cheese, kale and topped the whole thing with breadcrumbs and baked it again. Oh, and of course we need to speak about the most important ingredient in the whole dish. The pasta. Yes, friends. 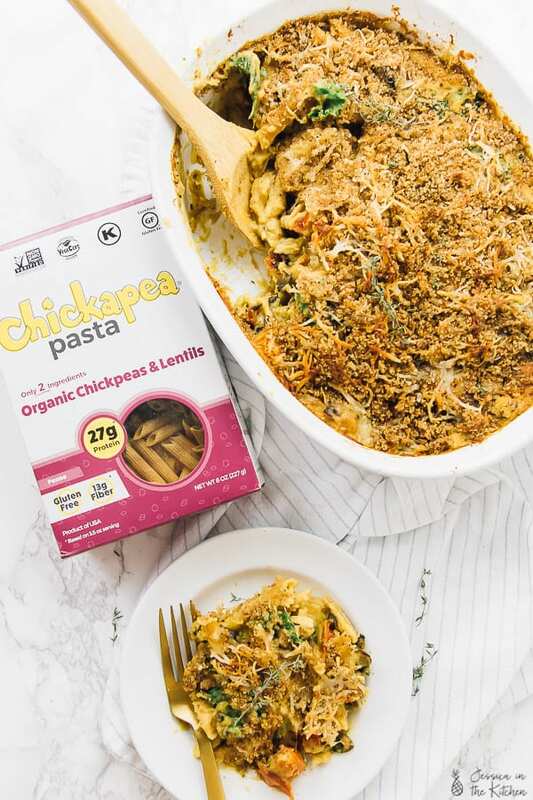 I have a surprise for you – I used Chickapea Pasta’s amazing gluten free pasta for this bake. 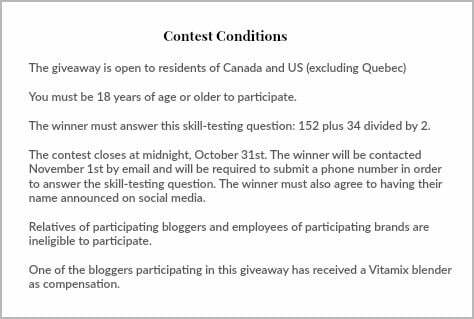 I also have ANOTHER surprise for you – there’s an amazing giveaway at the end of the post! So, I don’t mean to brag, but *brags* the Mr. has been gobbling this up. He is not a huge gluten free pasta fan, he’s a regular pasta fan – and he is LOVING Chickapea Pasta. That’s the only compliment that I needed. 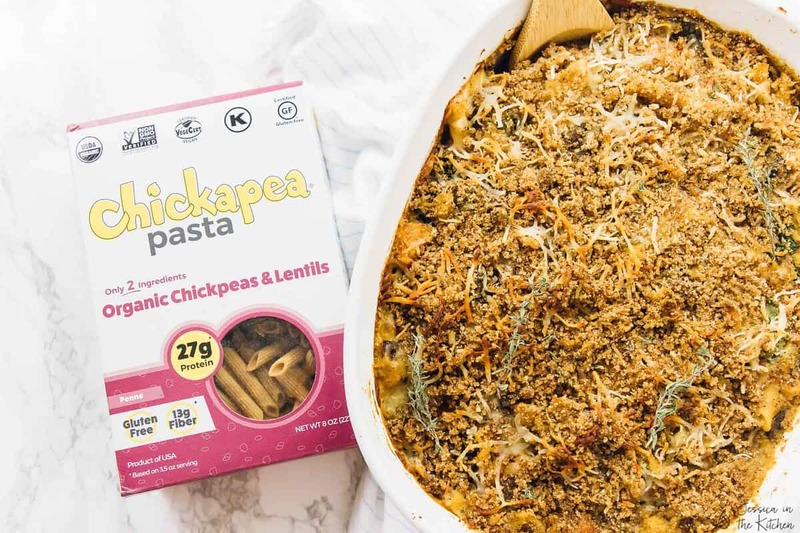 Chickapea’s Pasta is made from only 2 ingredients – chickpeas and lentils. Nothing else so it’s all natural which you know I love. It’s also organic, vegan, kosher and non-GMO. As you probably know I’ve been integrating way more lentils on the blog so that part really caught my attention. I love that this pasta is loaded with protein, 27g in each serving (insane) so you can have a great pasta, and be filled thanks to the protein and the 13g fibre. So, that butternut squash sauce. I love butternut squash. I’ve used it quite a few times on my blog before: in a soup, oh, in soup again, in pasta…I’m sensing a pattern. When butternut squash is cooked, it is so soft and creamy that it adapts well to anything that needs that texture. Here, I roasted the butternut squash in the oven. It adds more flavour than boiling it, and means you don’t have to stand over the stove watching it. In fact, the onions, butternut squash, tomatoes and mushrooms are all roasted at the same time. Talk about time saver AND flavour heaven! Your kitchen is perfumed with the aromatics of each of these. Honestly, the second they came out I popped a hot roasted tomato into my mouth. Then a piece of butternut squash. Okay, about 5 pieces, but who’s counting? Let’s pretend I didn’t eat ¼ of the mushrooms too. I couldn’t wait to taste the pasta sauce after this. After adding the Chickapea Pasta, onions, tomatoes and mushrooms to my casserole dish, I poured that divine sauce over the top. It honestly is so good and so easy to whip up in my Vitamix. 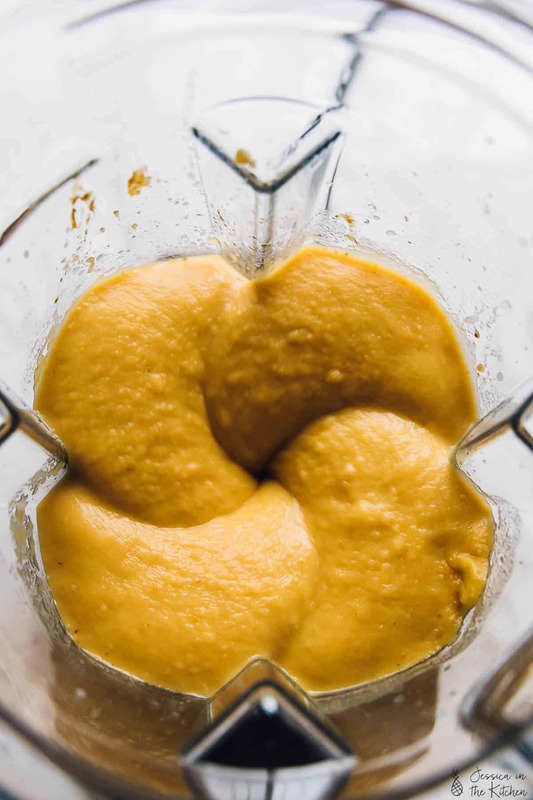 Look at that gorgeous swirl – my Vitamix blended everything so smoothly that I practically wanted to DRINK this sauce! After that it’s add some cheese, kale, breadcrumb topping, and then bake. 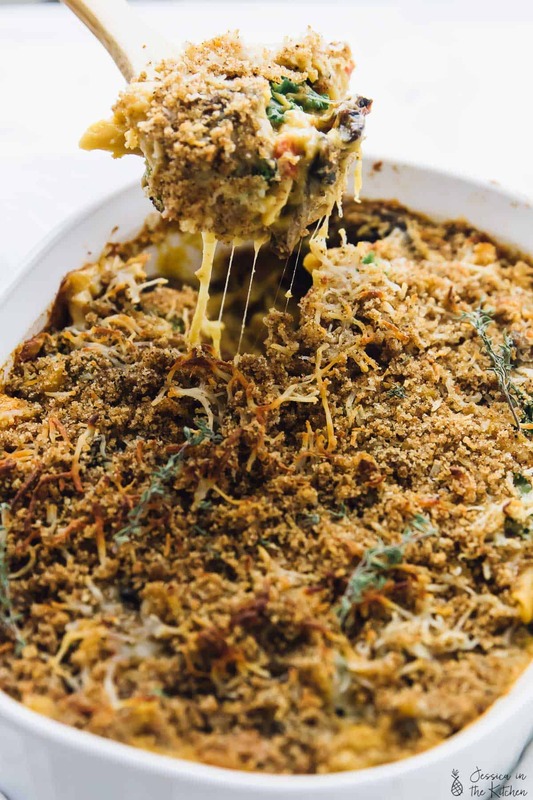 The butternut squash pasta bake is so divine, so delicious and so filling. I’ve been adding it to every meal and it seems to be getting better and better everyday in the fridge, so leftovers are so good from this. Also, it’s so easy to reheat, so know your family will be enjoying this for days. Oh, hey there again friends! It’s the holiday season so you know a giveaway is in order! 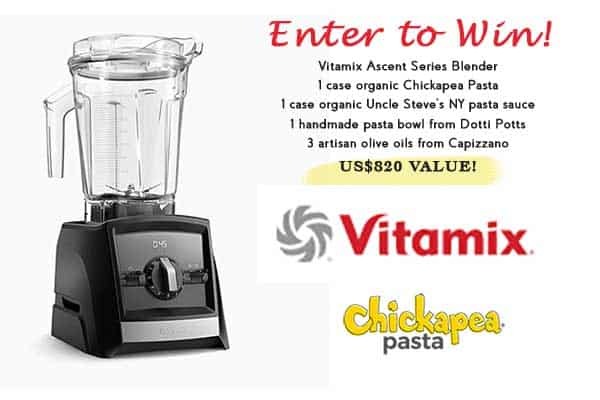 I teamed up with Chickapea Pasta and Vitamix to give away an amazing Vitamix, a case of Chickapea pasta, and a lot of other amazing things in their prize pack! I used a Vitamix to make my sauce, and I absolutely love it, so I guarantee it’s the best option for making this pasta bake. This post was sponsored by Chickapea Pasta who has collaborated with these amazing brands to bring you this great giveaway. All opinions are 100% mine. Thanks so much for supporting brands that support Jessica in the Kitchen! Preheat your oven to 400 degrees °F/204°C. Bring a pot of salted water to a boil. Add your Chickapea pasta and cook according to package directions. Remove from water, and set aside until ready to use. You’ll need about three baking sheets for this, or just split the sheets between the ingredients. Spread the butternut squash, tomatoes, and mushrooms separately on a baking sheet. Add the garlic cloves and the onions - I love to add about 4 cloves and a few pieces of onions to the butternut squash section (that’s going into the sauce), and distribute the rest over the tomatoes and mushrooms. Drizzle the olive oil over it all, and the salt and pepper and mix together with your hands or a wooden spoon to toss it with the veggies evenly. Bake for 35 minutes in the oven until the butternut squash is completely cooked through. Remove from the oven and allow to cool slightly. I love to now remove the peel from the garlic cloves and mash the garlic (with your fingers or a knife) for the tomatoes, mushrooms and extra onions section so it goes into the pasta mashed. 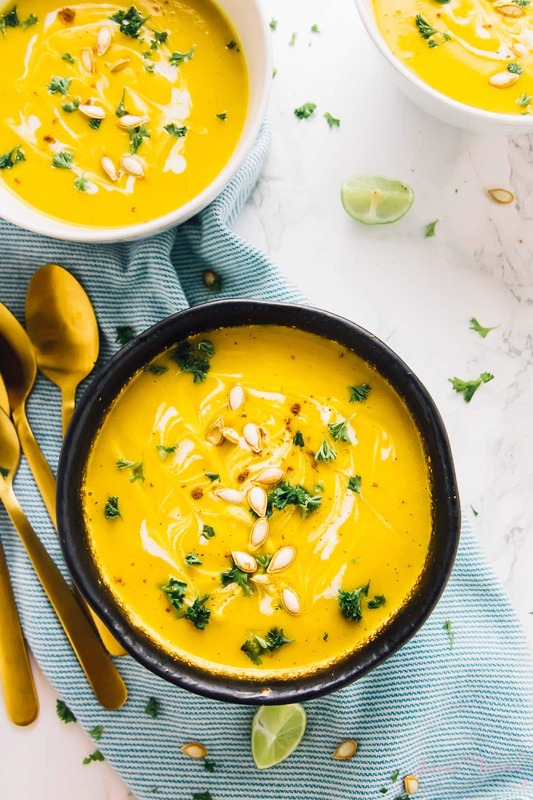 To make the sauce: mix the vegetable broth, almond milk, ½ teaspoon salt, red pepper flakes, and everything on the butternut squash baking sheet (with its portion of garlic and onions) to your blender. I use a Vitamix for this. Blend together until creamy and smooth. In a greased casserole dish, add the Chickapea pasta, the mushrooms, the tomatoes, the kale, the ½ cup cheese along with the extra mashed garlic and onions. Pour the sauce over the pasta mix, and then stir to combine. Top with the rest of the cheese, and the breadcrumb topping. Bake for 15 minutes to set the pasta. Remove from oven and allow to cool slightly. Dig in and enjoy! Talk about the comforting and delicious treat! This looks super duper delicious and good for you too, Jessica. This looks absolutely delicious and is gluten free #winning. Can’t wait to try it. This looks so comforting and perfect for fall (and maybe a glass of wine too…) Love that it’s packed with veggies as well! 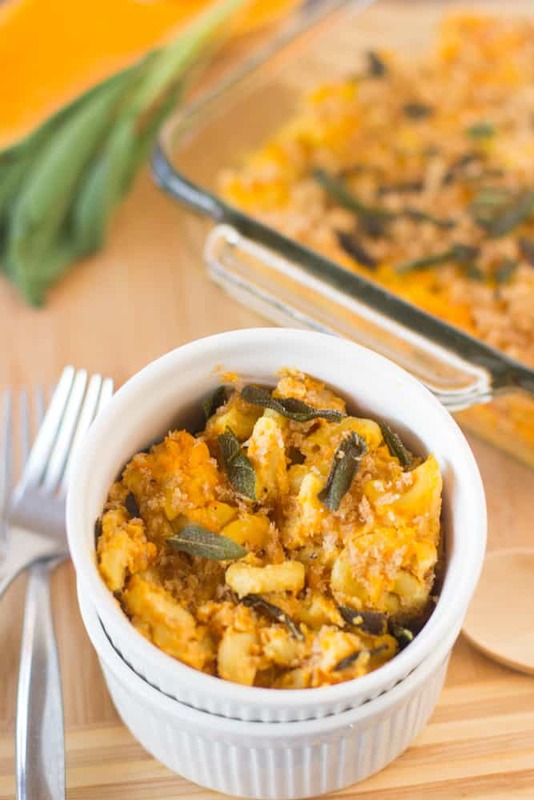 LOVING this Butternut Squash Pasta Bake! 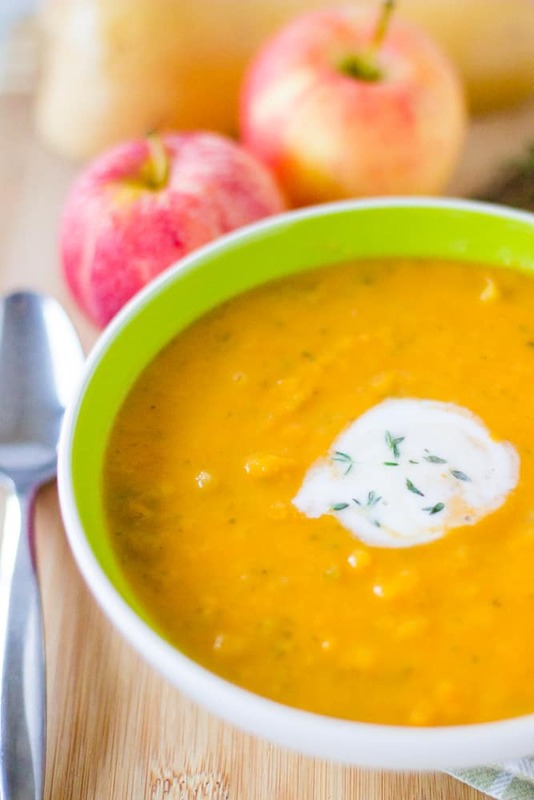 Perfect fall flavors and some of my favorite veggies inside… sign me up for a biiiiig bowl! This is the kind of dish I love to eat in the fall and this is the perfect way to celebrate National Pasta Day! Gorgeous meal Jessica! Such a healthy comfort food for all. I love all the veggies and wonderful flavours, Jessica! This is something I could totally fix for my family for dinner any day of the week. Loving the combo of ingredients. 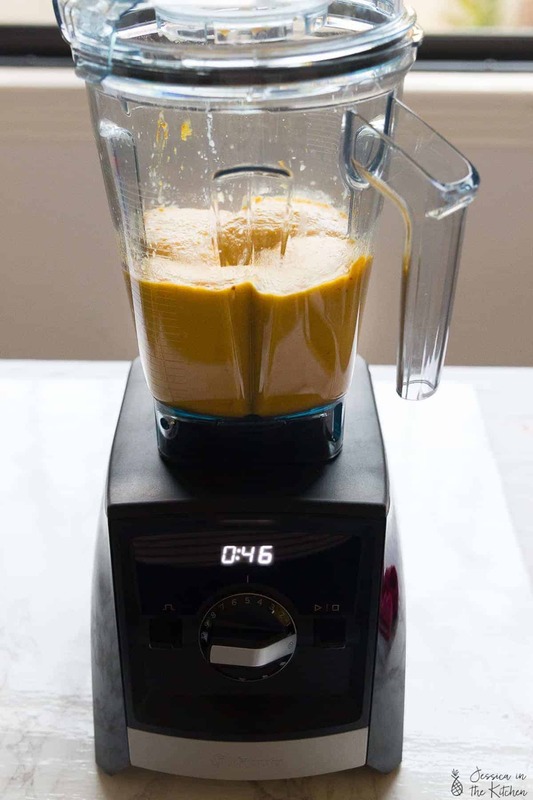 Gosh, I love my Vitamix for making creamy veggie sauces like this! I love using cauliflower and cashews for creamy sauces or to add to soups — but butternut! I have all the ingredients now but didn’t get a chance to make it yesterday — on my dinner menu! I’m looking forward to making this. Just bought my first VitaMix. I’m a bit confused by your comment? It is in gram measurements. I hope you enjoy so much and so happy to hear you bought your first Vitamix!! This looks amazing! Have you calculated any of the nutritional information for this dish? Thanks! It’s about 262 calories per serving! Ok, I’m officially obsessed with your blog. Definitely trying this recipe too! Aww thanks Lauren!! I hope you enjoy!! Yummmmmmmmm! With a few edits I made this dish Weight Watchers friendly and it was just what the doctor ordered! Thank you so much for this sweet and salty dish of amazingness.